Former Prime Minister Kukrit Pramoj said yesterday he was "extremely happy" over the Seni Government's decision to reject American proposals for the continued use of the monitoring facilities at Camp Ramasoon. M.R. Kukrit who was discharged from hospital on Tuesday, said by taking to a firm stand on the Ramasoon case, the government has shown its willingness to "accept reality" and uphold the contry's sovereignty above all other considerations. M.R. Dukrit, leader of the major opposition Social Action Party, told Siam Rath, tht the government's decision also goes a long way to prove that its policy is compatible with that of the SAP on this particular issue. M.R. 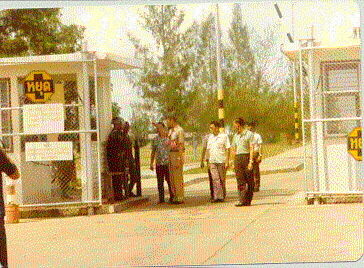 Kukrit saw nohing wrong with the government's decision to negotiate with the United States to accept somd of the left-over communications facilities. "Firstly, Whatever communications facilities left behind here will be used for internal purposes and secondly. Thao technications will man them," the former premier said. He was also optimistic that Thai-US relations will continue to be on a favorable basis despite the decision to have all American monitoring facilities and technicians withdrawn from Thailand by July 20. 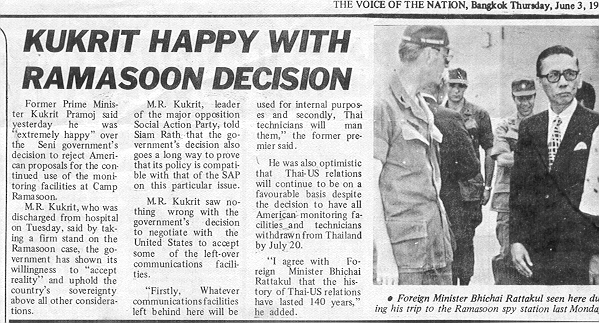 "I agree with Foreign Minister Bhichai Rattakul that the history of Tahi-US relations lave lasted 140 years," he added. 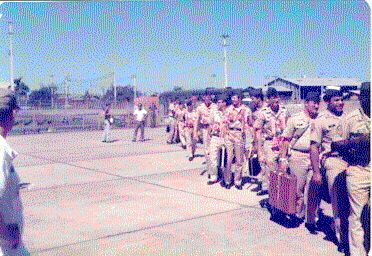 Photo Caption (The flag is lowered, folded and presented to Col Howard for shipment to the Commander, USASA. A moment those who served with the 7th will not soon forget. "Maybe an Army Officer is not supposed to feel anything, but I felt quite close to the troops. "It's a little different to go to a unit, take command and then be reassigned in a year, leaving everyone else behind," he continues. "But in this case, I had to stay...everyone was leaving me." The official log ends on May 19, but the remaining soldiers hold memories of another month. Memories of what Col Howard describes as the "absolutely outstanding" performance of his troops...."they performed with a professional flair and a sense of honor..."
"It was the PFC, the SP4 who made the retrograde a success," he comments. "There was a minimum of fuss and no prodding. we didn't always understand what was coming down from the Washington level, but everyone of them did their best." 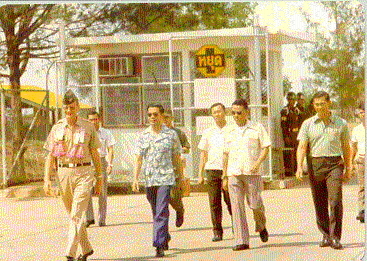 At 1425 hours on June 20, Col Howard turned, cast a lingering glance at the empty facility and left...the last American soldier to leave Ramasun Station. Congratulations are in order for the personnel of the 7th Radio Research Field Station. 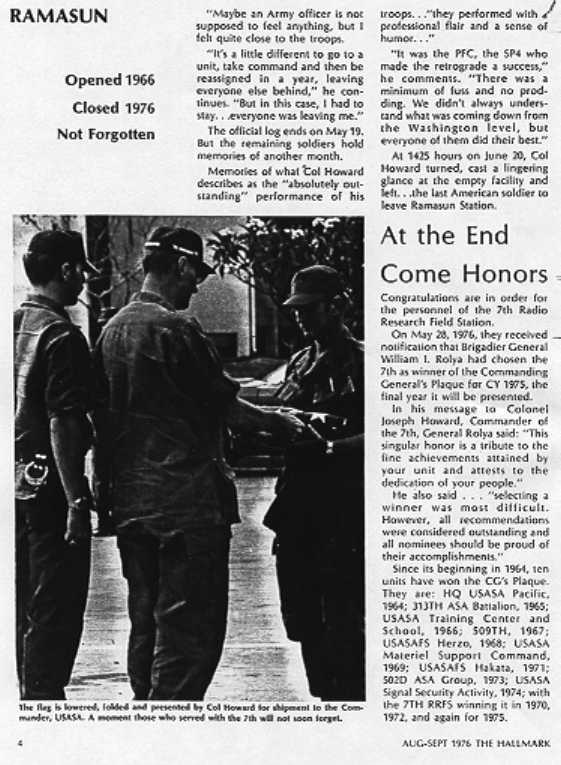 On May 28, 1976, they received notification that Brigadier General William I. Rolya had chosen the 7th as winner of the Commanding General's Plaque for CY 1975, the final year it will be presented. In his message to Colonel Joseph Howard, Commander of the 7th, General Rolya said: "This singular honor is a tribute to the fine achievement attained by your unit and attest to the dedication of your people." He also said . . . "Selecting a winner was most difficult. However, all recommendations were considered outstanding and all nominees should be proud of their accomplishments." 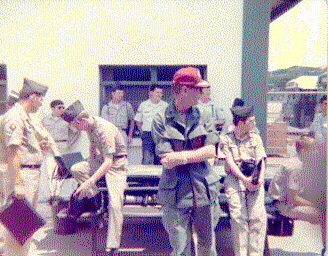 with the 7th RRFS winning it in 1970, 1972 and again for 1975. As dawn broke on the 22d, the second planeload of soldiers left Thailand and the communications circuits at the 7th flickered off and on. It would take most of the day to get those circuits back in total operation. For the next several days, modified planning would continue while awaiting word from the states on the future of negotiations with the Thai government. Although working under uncertain conditions, the "loggers" retained their humor. 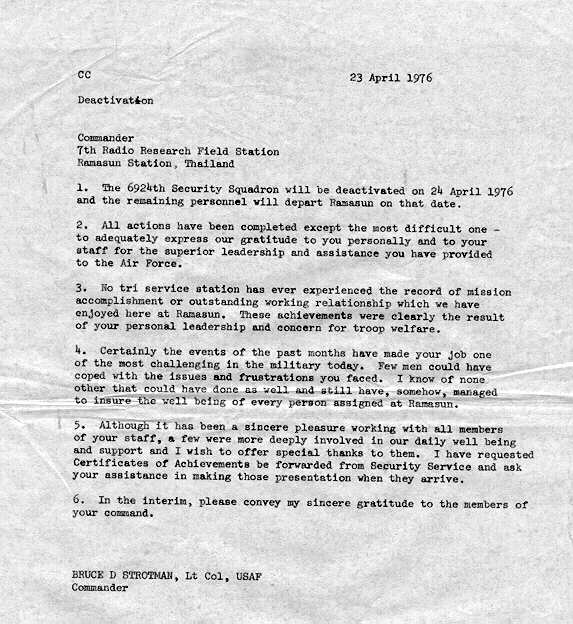 ...2000 March 26...two white ducks are swimming in the pond and all is quiet.."
On March 27, Arlington Hall officials decided to let the continuous communications circuit go back to an "as needed" basis. That would happen at 0415 hours. 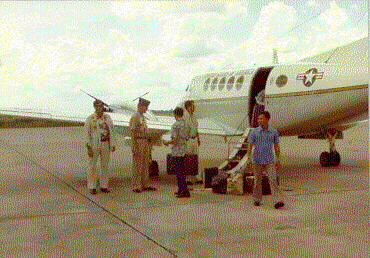 ...0415 Captain Pat Seiler called to see if there were any last requests (I don't mean that like it sounds)...there were none and both ends signed down. 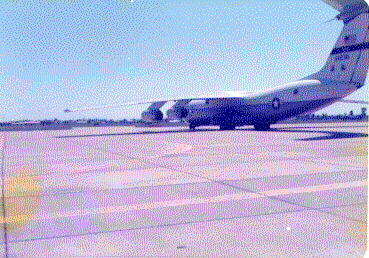 ...1050 April 1...a C5A aircraft came in- there is still some hope to the outside world. ...0400 April 17...message from Arlington Hall stating they are closing for the holiday weekend (Easter eggs, no close facsimile of, Duck eggs anyone! Finally word was received, the 7th RRFS would be deployed...the soldiers would be leaving. 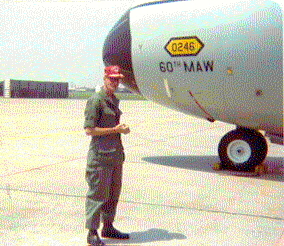 "I'd stand and see the people off...whole plane loads at a time", Col Howard reflects. "I always went down to see them off. This next is a sidebar to the above article with some ASA Vets comments. "At The End Came Honors"